7 What is the best 6 a side soccer formation? 6 a side soccer is a fast paced and exciting game which develops ball skills and the techniques needed to play in tight situations. There are a number of 6 a side soccer formations which you can try that will give your team a tactical edge over your opponent. In small sided games like 6 a side though, formations are not the only deciding factor. Individual tactics and ways of playing also have a big impact. With lots of quick passing and moving you can catch the opposition out of position which gives you the chance to score. By keeping the ball moving at all times in 6 v 6 soccer, you are asking the opponent to make several micro judgements about where to be, when to press and when to apply pressure. If you keep the ball moving enough, at one time they will make the wrong decision and you can capitalise. It takes skill and speed of mind to be able to move the ball constantly. You need to be thinking a minimum of one pass ahead all the time. Try this drill with your team to see how comfortable you are looking after 2 balls at the same time. This improves both your technical skills for passing in 6 v 6 soccer but also trains your mind to play one pass ahead. When you have a lead or a strong foothold in your 6 v 6 game, it’s important to keep the ball away from your opponents by retaining possession. They can't score if you have the ball. If you do lose it however, you must drop into your defensive shape as quickly as possible and let the opposition come to you. Your aim is to pinch the ball back and hit them on the counter attack by outnumbering them. The quicker you can make the transition from offensive shape to defensive shape and back to offensive shape, the more counter attacks you will enjoy. It is no good if one of your players decides they are a striker with no defensive responsibilities! All players should contribute defensively and teams should defend from the front with the strikers pressing to win the ball. Your front man should mark their defender to make it hard for them to get out. This puts pressure on the opposition at the right end of the pitch. You need good communication from your goalkeeper because the game is so fast-paced it can be hard to keep track. Your goalkeeper has the best view of any of your players and their field of vision is able to support those micro-judgements you need to get right with good information. Shooting is obviously one of the key skills to master in 6 a side soccer as it is in any form of the game. Whilst individual tactics are important, the team formation also plays a crucial role in 6 a side soccer. For many teams this is the most realistic in terms of occupying the field in a balanced way. It also allows for building play from the back and forming attacks. This formation is supported if you have players that are very dynamic and can play in both central and wide positions as there is constant interchange. This is a popular formation in 6 v 6 soccer as it enables the use of triangles all over the pitch, both defensively and offensively. It is a very popular formation for teams who want to really buy into the idea of moving the ball constantly which is a key tactic. Naturally in order to execute this formation to its full potential you need to have players who can really look after the ball and move it, ideally at pace. This formation is one of the strongest in 6 a side soccer and very suitable for exposing players to different aspects of the game as they will find different demands placed upon them to fill different roles playing both centrally and wide. An adventurous extension of any 6 a side formation with 2 defenders is for them to shift slightly so that 1 ‘screens’ in front of the single striker with the other dropping off for cover. This is a useful tactic to play on the frustration of the striker if they appear isolated. It also supports quick counter attacking play. The ability of a midfield player to screen his defence is a relatively modern concept in the game and came to prominence when French midfield player Claude Makele made this role his own at Real Madrid and Chelsea. In many ways Makele was quite a limited player, he was quite an average passer of the ball and wasn’t physically dominant. However his ability to read the game and break up play was virtually unrivalled. His role as a screening midfield player gave the other players in the team with more skills the freedom to go and do what they do best. This formation has 1 central defender, 2 midfield players who support the single defender on either side and 2 central strikers or as a variation, 1 central midfield player and 1 striker. For many people this is a highly effective formation in 6 a side soccer and allows players to show their talents in several different aspects of their game. It is only worth considering if you have a strong defender who is comfortable in defending situations where they might be outnumbered.The width created with this formation is constant and it gives you 3 players to play out from the back which some teams prefer. The wide players can get forward and support the attack when they can, although it is essential they are aware of their defensive positioning to ensure you are not outnumbered on counter attacks. The Central midfield player is pivotal and must link up with the striker effectively to create chances. The spine of this formation is the 1-1-1 and the two extra players support all aspects of play. Their ability to get up and down the pitch and sustain their levels of running are essential. This formation works at its best when these 2 players are able to play as high as the ball meaning they can support the defence, midfield or attack as required. This is a 6 a side formation you might want to consider transitioning into from 1-3-1, especially if you are trying to score a goal. It works best when you have 1 strong defender who can defend different types of threat, a disciplined central midfield player who will hold his position and provide cover and 3 attacking players who can be trusted with the ball. Being able to trust your front players to protect the ball is essential in this formation, it is no good if they are turning it over cheaply and leaving your single midfield player and defender exposed. 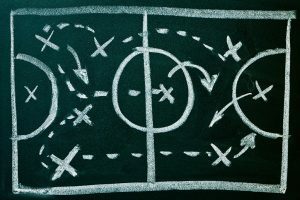 What is the best 6 a side soccer formation? 6 a side soccer is fast paced and sharpens skills in all areas of the pitch which are transferrable to bigger games. There are lots of ways you can improve your team by working on these drills and choosing the right formation for 6 a side soccer. If you’re still unsure which is the best 6 v 6 formation for you, why not try the natural dispersal of 2-2-1 to start and make adjustments as your go? Which 6v6 formation do you use? What skills do you think are most important in this format? What are your top tips for winning at the 6 a side level?